Hey Everyone! 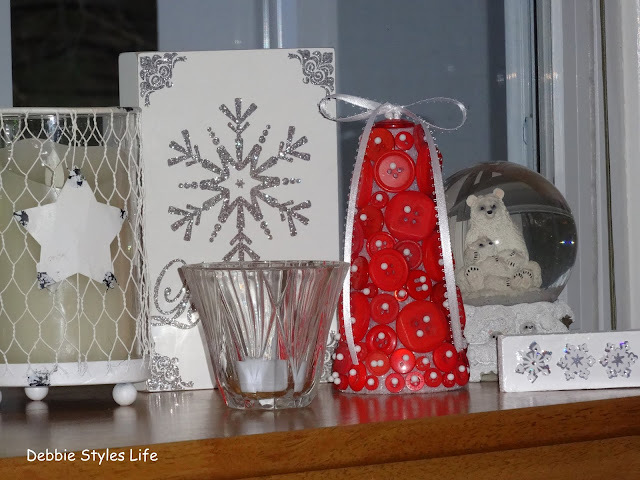 I'm excited to share two do-it-yourself decor projects that I have recently completed. First off is this pretty houndstooth winter wreath that is now hanging proudly on my kitchen wall! 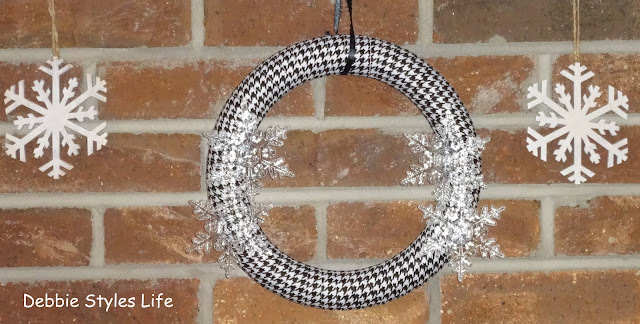 This project held a bit of drama as I had originally only purchased one roll of the houndstooth ribbon and found that I didn't have enough to wrap the entire wreath. 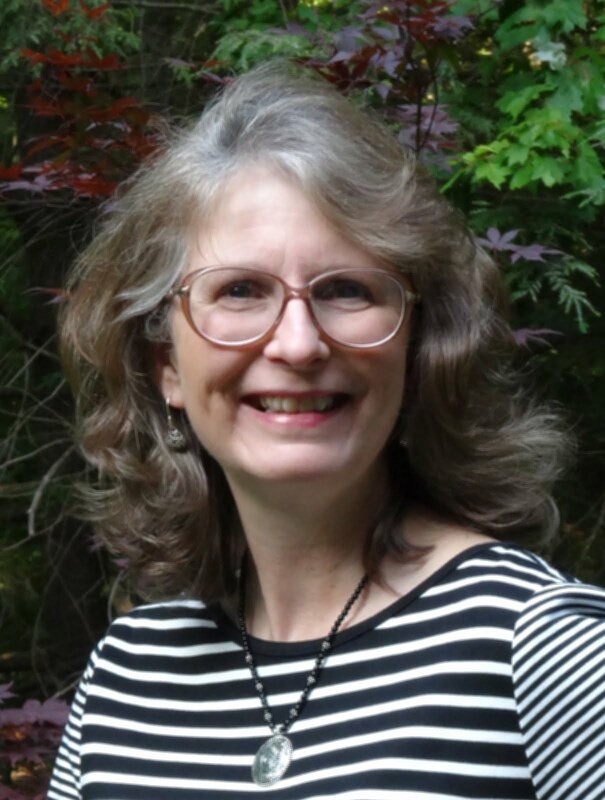 Several trips ensued back to A.C.Moore, where I had purchased the ribbon, and then to other craft stores when I found that A.C.Moore no longer had the same ribbon in stock. I had almost given up hope of being able to finish the project and was about to change out to another ribbon when I checked one more time at A.C. Moore today and, lo and behold, they had one roll of the ribbon I needed on the shelf! Hooray! I came home and immediately got to work finishing my wreath! The final touch to the wreath are these pretty clear plastic snowflakes that I added to each side of the wreath, securing them with straight pins. The wreath form that I used is styrofoam which I like to use for wreaths because it is so easy to secure the ribbon and decorations using straight pins. It is also easy to remove should I want to create a different wreath design at some point! I dearly love the houndstooth patterned ribbon and think it looks great against the brick wall in the kitchen! I'm also happy to have created this Valentine's Button Tree craft today! 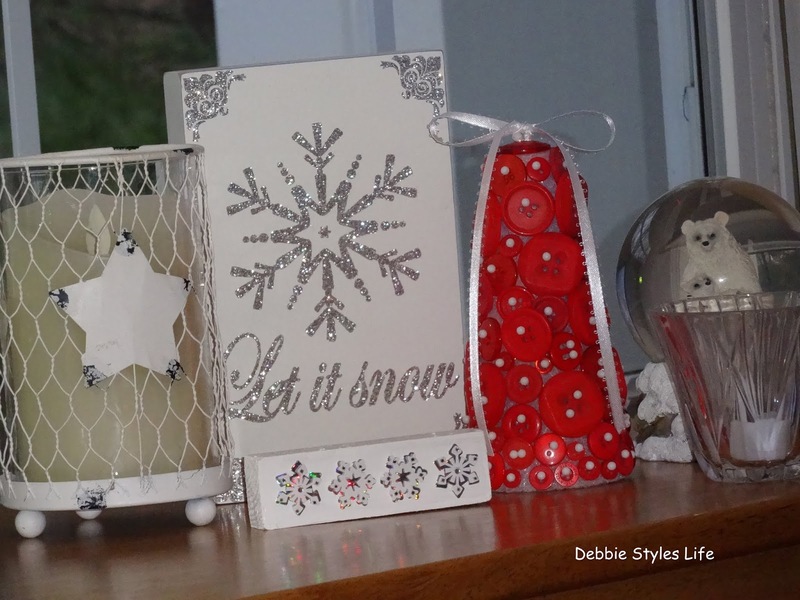 I think it looks pretty in the midst of my white winter decorations on the side table in the living room. I've been wanting to try to create a button tree for awhile so I picked up some red buttons, a styrofoam tree form and straight pins with white balls on the end at A.C.Moore today. This was an easy craft to do. I simply picked out various sizes of the buttons and placed them around the styrofoam tree securing them in place with either one or two of the straight pins pushed through the button holes. I finished off the tree with white ribbon tied at the top in a bow with the ends cascading down the sides. 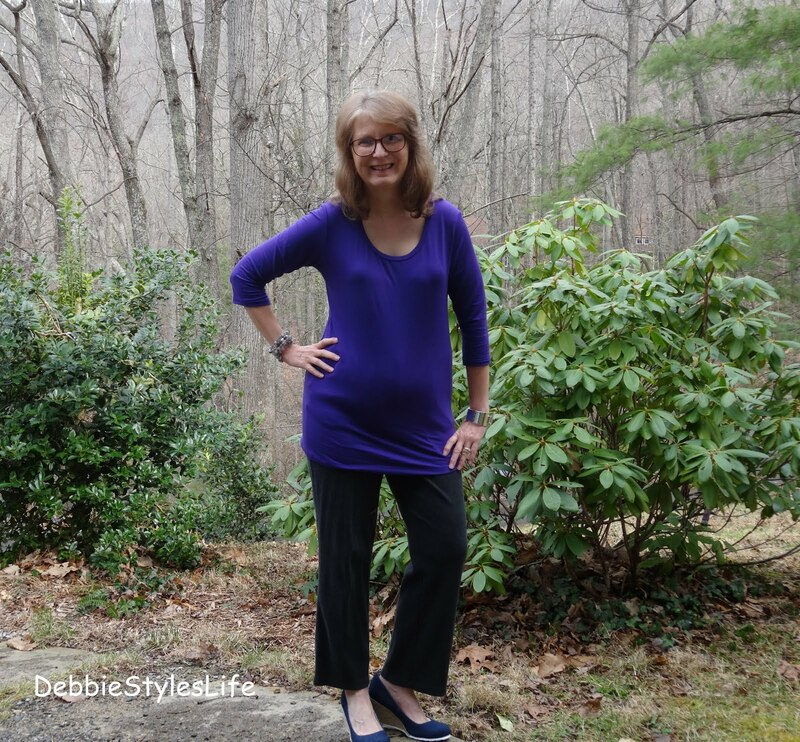 I love to do easy crafts that are completed fairly quickly (I need quick gratification!) and take pride in displaying home decor that I have made myself. Both of these projects were perfect crafts for me! And here's another little Valentine decor idea for you. 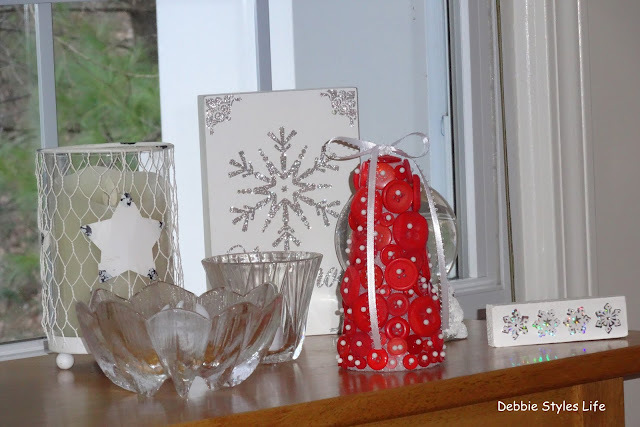 I picked up this cute glass covered in red and white hearts at the Dollar Tree. I filled it with red/white paper straws and placed it on my kitchen counter. 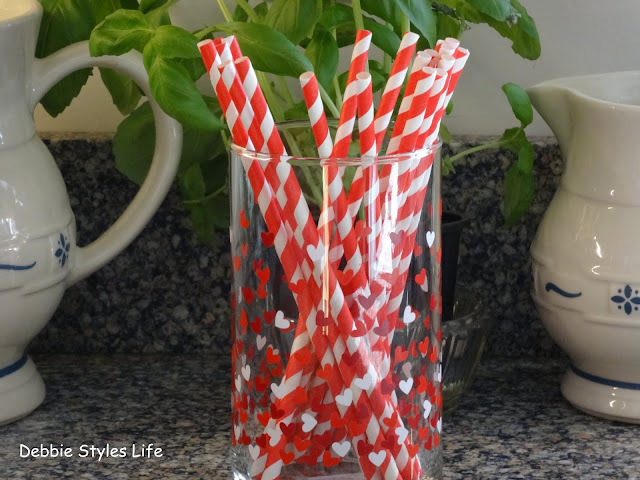 It's easy to grab a straw for iced tea and is also an easy and cute Valentine decoration! 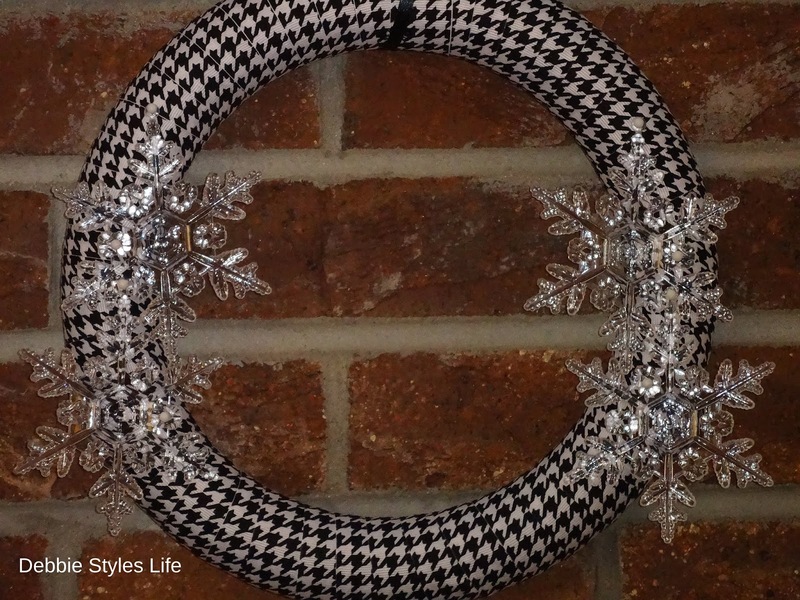 I absolutely love your houndstooth wreath! It's perfect next to your brick wall. I'm so glad you were able to find more of the ribbon. I know how frustrating it can be to run out of needed supplies. What a great idea your button tree is! It really adds a pop of color to your winter display as well as providing a great decoration for the upcoming Valentine's Day. 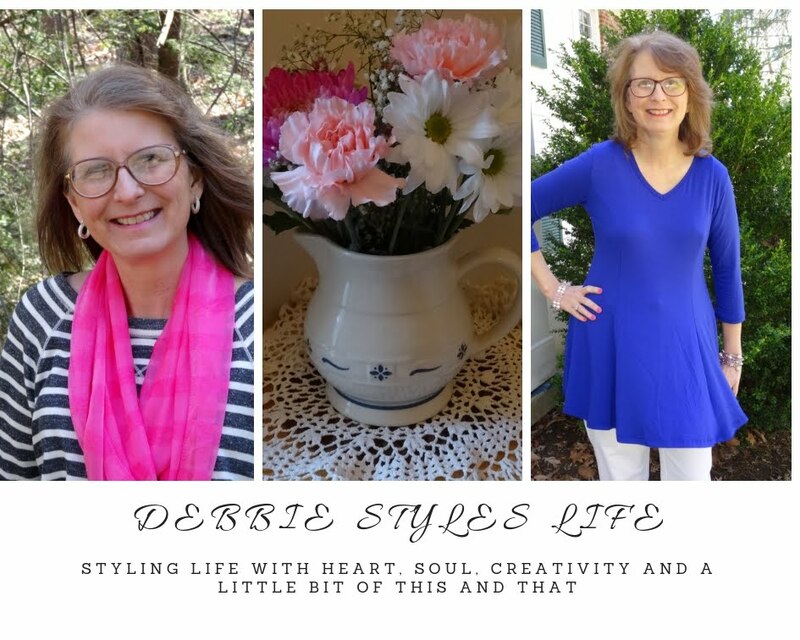 Great post, Debbie. 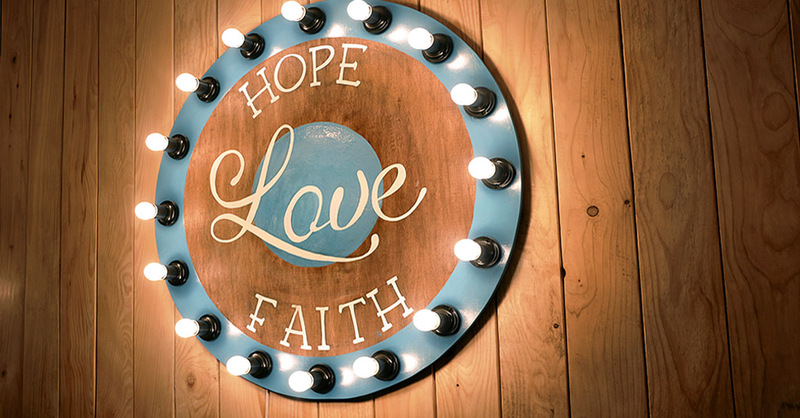 Love, love, love the wreath. I am thinking of duplicating using buffalo check ribbon. Too cute. And the button tree is very creative as well. TFS. Thank you, Sharon. You know I have worried over finding the houndstooth ribbon and I was so excited to find a roll! Just like it was on the shelf waiting for me! I think using buffalo check would be beautiful on this wreath! 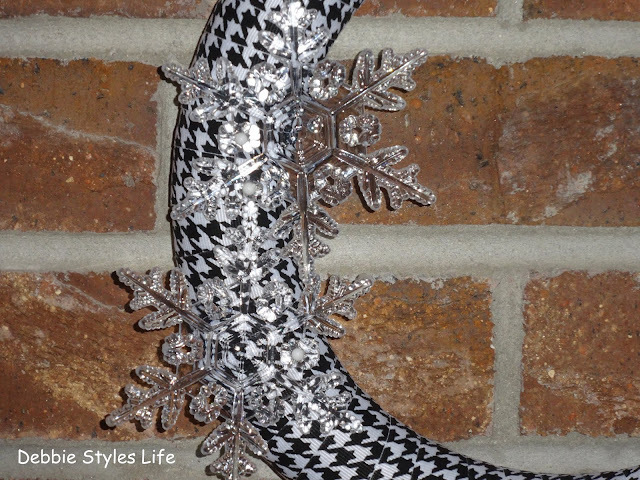 I was going to switch over to that type of ribbon if I couldn't find more houndstooth. Have fun creating your wreath!! What a great wreath! Love the houndstooth oattern, so unexpected and perfect for a wreath! The snowflakes are a cute winter touch! Glad you found that last roll of ribbon! I can see why that would sell out! Your winter display is very pretty. You certainly think of fun crafts to dress things up. The button tree is something I've never seen, but it is perfect for Valentines day! Thank you for sharing your projects!! Thanks, Karen! I am really happy with how this wreath turned out. The button tree is a different kind of craft, but I find it was fun to create and I enjoy looking at it on my table!